If I had to pick my all-time favorite book on the historical Jesus, it would probably be Jesus and the Victory of God by N.T. Wright. However, a close second would be the newly-released second edition of Jesus and the Eyewitnesses: The Gospels as Eyewitness Testimony by University of St. Andrews NT professor Richard Bauckham (Eerdmans, 2017). In neither case would I agree with all of the author’s conclusions, but in terms of apologetic effectiveness and scholarly depth, I have found them both to be exceptional. I recently started reading Bauckham in preparation to teach an adult Sunday School class on the historical Jesus. It took some determination to make it through all 615 pages, but it was certainly worthwhile. Bauckham presents a tour de force of argumentation against the 20th-century liberal theory of form criticism, which theorized that the Gospels were based only on the oral traditions of anonymous communities that developed constantly evolving, free-floating stories about Jesus’s life, for the purpose of suiting their contemporary needs rather than preserving genuine history. Bauckham proposes instead a reevaluation of the Gospels as the testimony of eyewitnesses to Jesus’ ministry. It would be impossible here to cover every single argument made in the book, but I will highlight what I found to be some of its strongest points. I will also attempt to engage with some of Bauckham’s critics (both conservative and liberal). Bauckham begins by lamenting the current state of much Jesus scholarship today, which tends to operate according to a dividing line between theology and history, and between the “Jesus of the Gospels” and the “Jesus behind the Gospels.” He blames this state of affairs on an unwarranted posture of methodological skepticism combined with historical postivism: as historical documents, the Gospels are presumed to be guilty until proven innocent, and whatever minimalist picture of Jesus that remains after critical scrutiny is devoid of any religious significance. Bauckham argues that a recovery of the category of “eyewitness testimony” can provide a better way forward in Jesus scholarship. Bauckham then draws our attention to the writings of the second-century church father Papias of Hierapolis, our earliest source on the origin and authorship of Matthew and Mark. In a much-discussed passage quoted by the early church historian Eusebius, Papias mentions his reception of the traditions of the earliest “elders” and “disciples,” expressing his own preference for testimony from a “living and surviving voice” rather than from written documents (Eusebius, Hist. Eccl. 3.39.4). Form critics have commonly interpreted this to mean that the early church must have valued oral tradition over historical writing, but Bauckham responds that this is a misunderstanding of Papias’s point. Instead, Bauckham argues, Papias is simply following the standard canons of ancient historiography, which privileged the testimony of living eyewitnesses who were active participants in the events they recounted. This would then, according to Bauckham, constitute the proper approach to the Gospels themselves. Some reviewers have found Bauckham’s application of Papias’s historiographical methods to the Gospels themselves to be questionable, but I think that is somewhat beside the point. What Bauckham’s argument here shows us is that Papias cannot be used by the form critics as evidence that the early Christians did not care about eyewitness testimony. They certainly did. Perhaps the strongest argument of Bauckham’s book is based on the relatively obscure field of onomastics, the study of personal names. 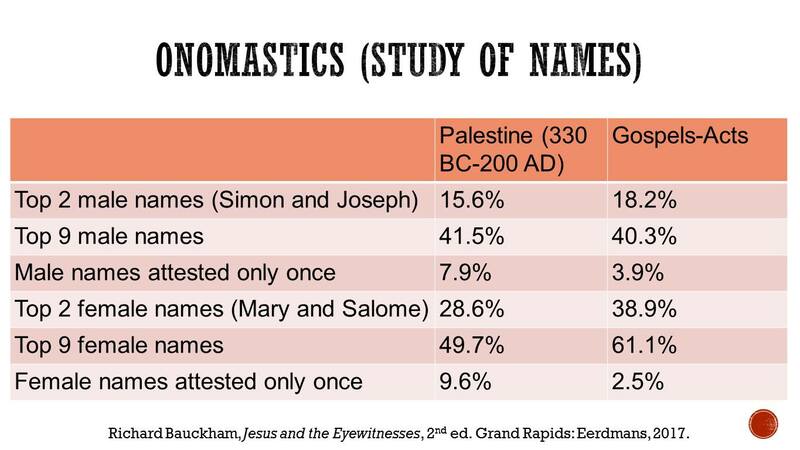 Drawing on a database of ancient Jewish names compiled by Israeli scholar Tal Ilan, Bauckham compares the relative frequencies of common names (like Simon and Joseph) and uncommon names (like Bartimaeus and Zacchaeus) in the Gospels-Acts with their corresponding frequencies in ancient Palestine, and he finds them to be surprisingly commensurate. Why is this so significant? Form critics have often supposed many of the people mentioned in the Gospels are mere fictions, attributable to the novelistic creativity of the early church. However, the likelihood that early (predominantly gentile, Greek-speaking) Christians would just happen to come up with a realistic proportion of common and rare Palestinian Jewish names would be slim to none. A better explanation would be to simply take the names as historical. Further, Bauckham argues, the reason why these names are included in the Gospels is to signal to the readers that these individuals were, in many cases, the Gospel authors’ own eyewitness sources. So, for example, we should suppose that Luke’s resurrection account of the road to Emmaus may have derived directly from the disciple Cleopas himself (Luke 24:18). Bauckham presents a few additional evidences that the Gospels are grounded in eyewitness testimony. These include a literary device that Bauckham calls the “inclusio of eyewitness testimony.” An inclusio, also known as literary “bracketing” or an “envelope structure,” consists of framing a given text with similar material at the beginning and the end of the text. (A commonly cited example of an inclusio would be Jesus’ cursing of the fig tree, which is mentioned both before and after the cleansing of the Temple in Mark 11.) Bauckham makes a case that we find certain disciples serving the function of an inclusio in the Gospels. Peter, for instance, is the first and last named disciple in Mark’s Gospel (Mark 1:16-28; 16:7). John also contains an inclusio of Peter but subtly “demotes” him by placing him within the slightly larger inclusio of another, anonymous disciple (John 1:35; 21:24), whom Bauckham identifies as none other than the Beloved Disciple, the author John himself (though not, as is often supposed, John the son of Zebedee, one of the Twelve; see below). Luke, on the other hand, retains the Petrine inclusio as primary (4:38; 24:34), but he places within it another inclusio consisting of the women disciples (8:1-3; 24:10), which brackets all but the earliest parts of Jesus’ ministry. Bauckham compares these inclusios with similar ones found in ancient authors Lucian and Porphyry, and he concludes that this literary device was intended to indicate to the reader that the author’s primary sources were eyewitnesses. Thus, Mark’s primary source was Peter, John’s primary source was himself, and Luke’s primary source (aside from Mark/Peter) was the women disciples—probably especially Joanna, who is named only in his Gospel. Bauckham gives considerably less attention to Matthew’s Gospel throughout his book, which I found to be somewhat disappointing. Similarly, he assumes rather than demonstrates the truth of the standard Two-Source Theory (Mark and Q are our earliest sources, which Matthew and Luke later used independently of each other), but if one accepts a different view of Synoptic origins (say, if Luke directly used Matthew or vice versa), then that would have a significant impact on one’s evaluation of the Gospels. Bauckham also devotes a chapter to assessing eyewitness memory. The results of recent psychological and anthropological studies on memory have often been misunderstood and misapplied. In general critics have tried to emphasize the unreliability of memory, while conservatives have tried to emphasize its basic reliability. Bauckham demonstrates that the events recorded the Gospels meet all of the criteria for those memories that are most likely to be reliably preserved: they are unique, significant, consistent in their essential elements (varying only in their peripheral details), and would have been reinforced by frequent rehearsal. And contrary to the claims of the form critics, the Gospel stories probably would have crystallized in more or less fixed form very early on, and would not have undergone radical alteration in the early church. Even the disciples’ own reinterpretations of Jesus’ life in light of their post-Easter spiritual experiences would not have had a significant impact on the content of these stories (as opposed to their meaning). Here I would only remark that I think that NT scholars (both conservative and liberal) have generally overestimated the value of contemporary research on memory as it pertains to Gospel studies. As Jesus declares to his disciples, “But the Helper, the Holy Spirit, whom the Father will send in my name, he will teach you all things and bring to your remembrance all that I have said to you” (John 14:26). So we should rightly expect that the disciples’ memories would have been supernaturally preserved intact. That said, there is nothing wrong with pointing out the flaws in form critics’ misuses of memory studies—most of which rely on unwarranted comparisons with clinical studies on trivial memories, or with rumor transmissions, or with folklore in oral cultures—none of which properly corresponds to the unique status of the Gospels, which were composed during the lifetime of eyewitnesses, and which served as the foundation for the early church’s understanding of its own identity and of God’s saving acts in history. With a thesis so counter to modern scholarly orthodoxy, Bauckham’s work has understandably attracted a fair share of critics. Thankfully, his expanded second edition includes three additional chapters responding to his critics—covering the evidence for eyewitness testimony in Mark, the identity of the Beloved Disciple in John, and the death of form criticism. Perhaps one of the most common criticisms of Bauckham, mentioned in particular by Alan Kirk, is Bauckham’s supposed overemphasis on the role of individual eyewitnesses in the transmission of the Gospel sources, as opposed to communal sources. Kirk and others expect that documents derived directly from individual eyewitness sources should include the more “idiosyncratic, first-person perspective of eyewitnesses,” as well as explicit citations of sources as eyewitnesses. I do not find such objections to be particularly compelling. The final forms of the Gospels can easily be explained in terms of their intended communal use (particularly in the early church’s preaching and liturgy), without recourse to positing a communal source in their supposed chain of transmission. In this regard, there are important differences between the Gospels and ancient historiography. Kirk also asks why the Gospel authors felt compelled to seek out individual eyewitnesses, when they had a “publically available authoritative tradition at their disposal.” But this simply invites the question, why was the publically available tradition authoritative in the first place? Surely it was because it was rooted in eyewitness testimony. The authority did not inhere in the anonymous communities themselves, but in their founders—the apostles and early disciples of Jesus who first proclaimed the Gospel to them. So would we not expect the Evangelists to have sought out these same founders as their chief sources? At the same time, it needs to be said that not all of Bauckham’s critics are to his left. He has caused some consternation among conservative evangelicals over his claims about the authorship of John and Matthew. He devotes a considerable amount of space to arguing that the author of John was himself an eyewitness to Jesus, and that he should be identified with the “disciple whom Jesus loved” (John 13:23; 20:2; 21:7; 21:20). On both of these points, Bauckham takes a stand against the consensus of liberal scholarship. But unlike most conservatives, he argues that this Beloved Disciple is not John the son of Zebedee, but rather another John known from the writings of Papias simply as “John the Elder,” who would likely have come from Jerusalem rather than Galilee. Personally, I still find the case for John the son of Zebedee as the author to be fairly strong. The most effective response to Bauckham I have read in defense of the traditional authorship of John comes from Andreas Köstenberger and Stephen Stout. Bauckham does interact with them in his second edition, but not with all of their arguments. One point that I wish Bauckham had responded to was their argument from Bauckham’s own “inclusio of eyewitness testimony.” In the Synoptic Gospels, we find that the first disciples called by Jesus are the brothers Peter and Andrew, who are together casting nets for fish, and immediately thereafter James and John, who are mending nets in their boat (Mark 1:16-20). John’s account is somewhat different; the first disciples called are Andrew and an anonymous disciple (whom Bauckham identifies—rightly, I believe—as the Beloved Disciple), and then Peter only after Andrew has brought him to Jesus’ lodging. John’s Gospel does not mention the call of the sons of Zebedee at all. But surely the easiest way to harmonize these two accounts would be to identify the anonymous disciple of John 1 with one of the sons of Zebedee in Mark 1. Further, both the first and the last appearances of the Beloved Disciple in John’s Gospel are in the context of fishing in the vicinity of Galilee (in the case of his initial call, this is known from Mark’s account). So wouldn’t it be simpler to suppose that the Beloved Disciple was himself a Galilean fisherman (as we know John the son of Zebedee to have been) rather than a resident of Jerusalem, as Bauckham argues? That said, I should remark that Bauckham’s claims regarding Johannine authorship should cause no significant trouble to those of us who hold to the inspiration and inerrancy of Scripture. As far as I can tell, there is nothing theologically problematic in suggesting that John’s Gospel was written by an eyewitness disciple other than one of the Twelve—after all, Mark and Luke were not apostles or eyewitnesses! I find this to be problematic for at least three reasons. First and foremost, it would mean that the author of Matthew was making up a story about which he had no real knowledge, and this would seem to compromise the doctrine of biblical inerrancy. Second, I do not find the call of Levi to be sufficiently generic so as to apply to the call of any tax collector. Even though the narrative is quite brief, how many tax collectors could we presume were called by Jesus while they were sitting in their tax booth, and who responded by immediately getting up and following him? (This point was also made over at Triablogue.) And third, it seems that Bauckham is giving too much weight to the onomastic evidence here. We can grant that it would have been extraordinarily rare for a Palestinian Jewish male to bear two common Semitic names. But it wouldn’t take too much imagination to suppose that a Jewish tax collector might want to change his name after deciding to follow Jesus. Perhaps even Jesus himself changed his name to Matthew. He did this in the case of Simon Peter, after all. The name Matthew also has symbolic significance; it means “gift of the Lord” in Hebrew, and it sounds similar to the Greek word for “disciple” (mathētēs). This may not be decisive, but it should caution us not to be too hasty in rejecting Matthew’s authorship. Despite these reservations of mine, Jesus and the Eyewitnesses provides us with a powerful case for trusting the Gospels as eyewitness testimony. It’s not for the faint of heart, and I do hope that Bauckham someday publishes a slimmer, more lay-friendly version. But I suspect that this volume will change the direction of Gospel scholarship for years to come. I think it would be an essential addition to any theological library. Alan Kirk, “Ehrman, Bauckham and Bird on Memory and the Jesus Tradition,” Journal for the Study of the Historical Jesus 15 (2017): 88-114. Andreas Köstenberger and Stephen Stout, “The Disciple Jesus Loved: Witness, Author, Apostle,” BBR 18.2 (2008): 209-231.